Spring Training officially began over a week ago, and, depending upon your baseball news outlet of choice, somewhere between “a lot of” and “way too many” quality free agent pitchers remain on the market. The Yankees have, of course, been linked to all of them in one way or another, and the notion that Brian Cashman could and/or should don his ninja apparel to swoop in and sign one to a bargain deal has only increased with time. The fact that the team has made no secret of its hope to add starting pitching even as players report to camp only fans the flame. 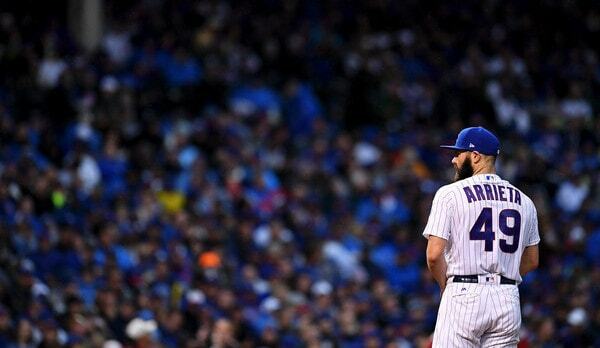 Jake Arrieta is the best starting pitcher on the market nowadays, and there is no shortage of discussion about what it would take for him to end up in pinstripes. Talking heads have suggested a deal akin to what the Red Sox gave J.D. Martinez – 5-years, $110 MM, with opt outs after 2019 and 2020 – and our own Mike Axisa suggested 3-years and $75 MM, with opt outs after each season; this includes signing Arrieta mid-season, but that’s not important for the purpose of this post. While both options sound good for a pitcher with Arrieta’s track record (and ignoring any luxury tax implications), I would not be comfortable giving the soon-to-be 32-year-old a multiyear deal with player options. Why, you ask? I think Arrieta is one of the big free agent landmines of this class. 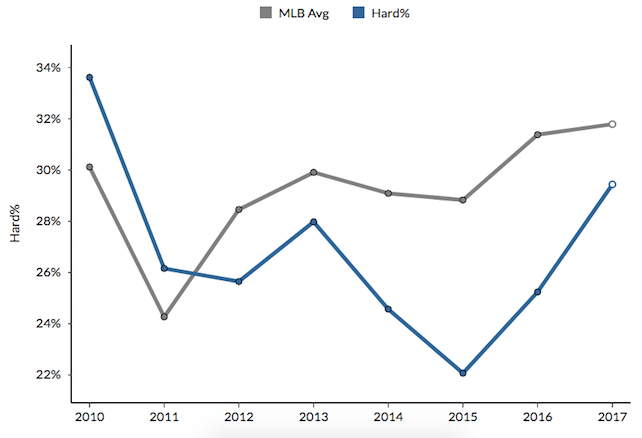 It’s worth noting that players are simply hitting the ball harder now, and Arrieta is still allowing less hard contact than the average pitcher. Nevertheless, this is another example of him heading from elite towards average over the last year or so, and that’s not what you want to see with a potential big-money signing – particularly one that will be 32 on Opening Day. 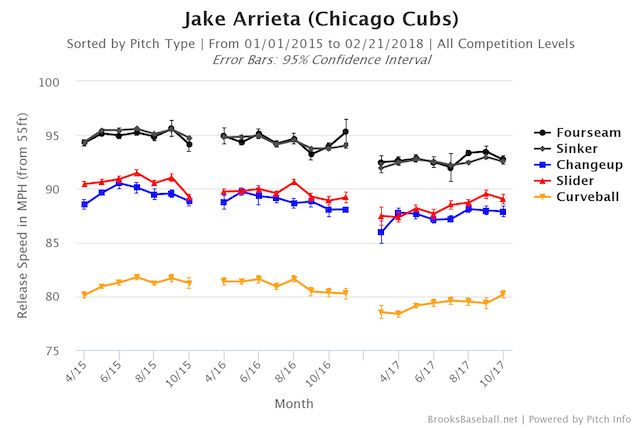 None of this is to suggest that Arrieta will be bad in 2018, or even 2019 or 2020. Rather, I just don’t see him continuing to be a top of the rotation starter, and that is what he is hoping to be paid as (even in this depressed market). What we have here is a pitcher in his 30s who’s striking out fewer batters, losing velocity, giving up more fly balls, and giving up harder hit balls in general, and the discussion is giving him a multiyear deal … and I feel that it is far riskier than has been let on. Would I give him a fair bit of the Yankees remaining funds to join the rotation on a one-year pillow contract? Definitely. Would I blow up the luxury tax plan for this year for said pillow contract? Yes, I think so. But I wouldn’t want to be tied to him for multiple seasons – and that’s probably what it’s going to take. We’ve reached the dog days of Spring Training. Pitchers and catchers reported a week ago and position players joined them over the weekend, but Grapefruit League games haven’t started yet. Nothing’s really going on and those grainy spring Twitter photos from half-a-field away have lost their luster. Exhibition games start Friday. Until then, we wait. Fortunately the hot stove is starting to get hot and that’s entertaining. Yu Darvish signing with the Cubs kinda started it all. Eric Hosmer signed with the Padres shortly thereafter, and yesterday the Red Sox signed J.D. Martinez. The move everyone expected to happen finally happened. Spoiler alert: The AL East is going to be a dogfight. When is it not? Anyway, at the moment the Yankees have $22M to spend under the luxury tax threshold, or $12M when you remove the $10M they’re planning to set aside for midseason pickups. I expect that $12M to go somewhere before Opening Day. Maybe Mike Moustakas falls into their laps. That seems more and more likely with each passing day. Maybe it’s Alex Cobb. Or Lance Lynn. Or Chris Archer! Who knows? I think that $12M is going somewhere, but what if it doesn’t? What if the Yankees stand pat, go into the season with two kid infielders, and set aside a whopping $22M for midseason additions. That is a frickin’ ton. Remember, luxury tax hits are pro-rated. Trade for a $20M player at the midway point and the tax hit is only $10M. Having $22M to play with means the Yankees could take on some serious salary at the trade deadline, if necessary. Since there’s nothing else going on these days, I’ve been thinking about hypotheticals regarding that midseason addition money lately. It is entirely possible the Yankees will need to add a starting pitcher and two infielders at the trade deadline. It could happen. And if it does, the have the money to spend. But if it doesn’t? Will they really just pocket that $22M? I wouldn’t put it past ownership. Three years and $25M per season, prorated in 2018. Opt-outs following 2018 and 2019. Full no-trade clause, because why the hell not. If the Yankees and Arrieta wait until after the draft in June, the draft pick compensation goes away. The Yankees could technically sign Arrieta to a minor league deal before the draft, have him make some minor league tune-up starts to prepare for the season, then sign him to the big contract after the draft to avoid the draft pick compensation, and get him into the rotation as soon as possible. Not against the rules! Financially, when you add a player at midseason, the luxury tax hit is prorated. So say the Yankees sign Arrieta at the halfway point of the season, just to make the math easy. His $25M salary prorates to $12.5M, and that’s the luxury tax hit in 2018. The luxury tax hit then jumps to $25M in 2018 and 2019, assuming Arrieta doesn’t opt-out. When the Yankees traded for David Robertson, his luxury tax hit was prorated last year. This year it’s the full amount. For all intents and purposes, that contract would be a pillow deal on steroids. Arrieta gets to pitch for a contender the rest of the summer — I imagine he’d be pretty desperate for work if he’s still unsigned come June — then reevaluate the market after the season. If he wants to test free agency, he can opt-out. If he doesn’t, he can stay and see what happens next year. And if he gets hurt this year or next, the opt-outs serve as an insurance policy. Why sign Arrieta? Well, he’s really good for starters, and it’d be hard to come up with a better pitcher at midseason for nothing but cash. 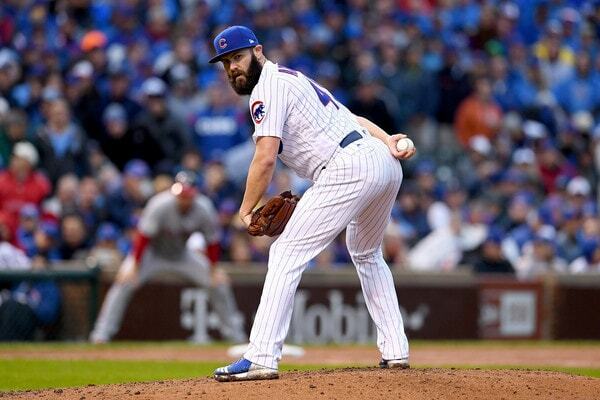 Last season Arrieta had a 3.53 ERA (4.16 FIP) with 23.1% strikeouts, 7.8% walks, and 45.1% grounders in 168.1 innings around hamstring trouble. He’s good, he has a championship pedigree, and when he goes into Terminator mode, Arrieta is as dominant as anyone on the planet.
? Sign Arrieta at midseason and the Yankees would get a rent-an-ace while keeping their draft picks, and Arrieta would get a pricey contract that allows him to test the market the next two offseasons or collect $50M. And the Yankees would still stay under the $197M luxury tax threshold. A win-win. Guys like Roy Oswalt, Pedro Martinez, and Roger Clemens have waited until midseason to sign in the recent past. It wouldn’t be unprecedented. Now, that said, the chances of this happening are incredibly small. Free agents are starting to come off the board — Boras found homes for Hosmer and Martinez within the last few days — so it’s probably only a matter of time until Arrieta gets a deal. My money is on the Nationals, but we’ll see. Like I said, this all sounded better in my head before free agents started signing and it seems like guys would legitimately go into the season without contracts. Realistically, there’s no way for the Yankees to sign Arrieta now and stay under the luxury tax threshold. He’s not taking that steep a discount, if he takes one at all. And, frankly, I have no interest in Arrieta on a long-term contract. Too many red flags. A short-term deal like the one I presented though? Sign me the hell up. Arrieta with a chip on his shoulder could be a great midseason pickup. The Yankees are probably going to spend that $22M under the luxury tax threshold when it’s all said and done. My guess is they’ll spend some now and some later, at the trade deadline. Landing an impact player like Arrieta at midseason while keeping draft picks and staying under the threshold is a pipe dream, but at this point of the spring, crazy hypotheticals come with the territory. In the aftermath of yet another strong Jeff Niemann performance against the Yankees — whose seven-inning, one-run outing last night improved his career ERA against New York to 2.75 over six starts — I couldn’t help but wonder what Niemann’s overall numbers against the Bombers looked like in relation to other starters that have consistently had success when facing the team. Most of the names on this list would probably align with Yankee fans’ perceptions of pitchers the team typically struggles against — and frankly I was shocked that King Felix’s name didn’t top the list. His aberrant start last September slightly skewed his numbers, but prior to that completely out-of-character dud, no pitcher in baseball had had more success against the Yankees. Felix had thrown 40 innings of six-run ball (1.35 ERA) against the Yankees, including 24 innings of one-run ball (0.38 ERA!) at Yankee Stadium dating back to the beginning of 2010, and not having been saddled with a loss against the Bombers since May 3, 2008. However, there are a couple of eye-openers — I can’t say I expected Carl Pavano to make the top 10, although I suppose that makes some sense given his unique brand of right-handed slop. And the other is Niemann, who, believe it or not, has the third-lowest ERA among all starters against the Yankees since the beginning of 2009, his first full season in the bigs. Now, I don’t mean to knock on Niemann, who clearly has the Yankees’ number, but it does seem a bit odd that a hurler who’s been a decidedly average — if not below-average — right-hander during his career (102 ERA-; 105 FIP-) would be so successful against the best offensive team in baseball during that timeframe. Here’s where things get interesting. Four of the top five pitchers in this study throw a sinker more than 30% of the time, and the fifth — Niemann — just misses that cutoff, at 29% of the time. Additionally, both Pavano and Jake Arrieta are also sinker-heavy, which means that seven of the top 10 throw a sinker more than 25% of the time. Of course, it’d be easy to say, “well maybe the Yankees just stink against sinkers,” but that’s not even remotely true, as they have the second-best wSI/C in baseball since 2009. Still, there’s something about this variety of sinkerballer — several of whom also prominently feature a curve (Hernandez, Niemann, Haren and Arrieta each go to the hook more than 10% of the time) — that seem to have the Yankees’ goose cooked.